The next step after the successful installation and activation of the plugin is to open a Software System that has been previously created using Sonargraph. 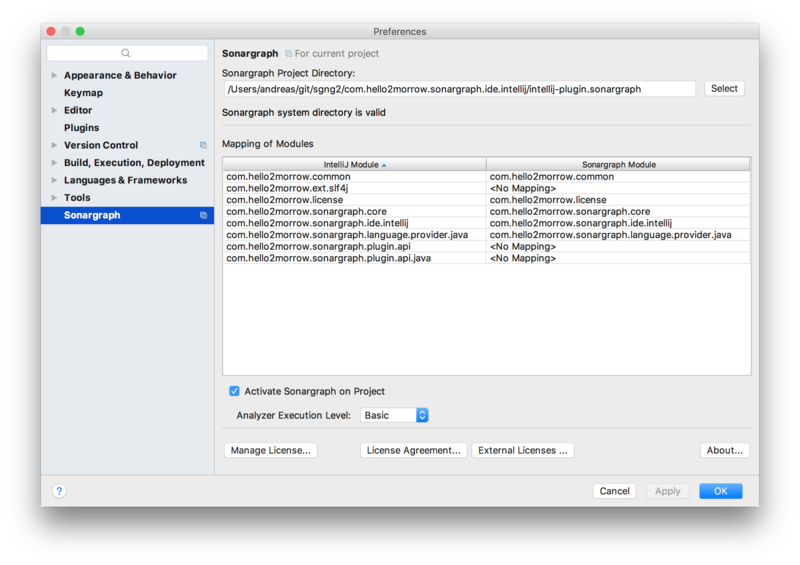 On the Intellij settings, go to "Other Settings" → "Sonargraph" and select the Sonargraph system. Sonargraph will match its own modules to Intellij's modules based on source root directories. The "Mapping of modules" table shown above indicates the result of the matching process. Once the system is opened and the matching is completed, use the "Activate Sonargraph on Project" to enable Sonargraph's analysis and user interface components in your Intellij IDE. The "Analyzer Execution Level" can be set to one of "Full", "Advanced", "Basic", or "Minimal". The tooltip shows which Analyzers will be run for each of the levels.